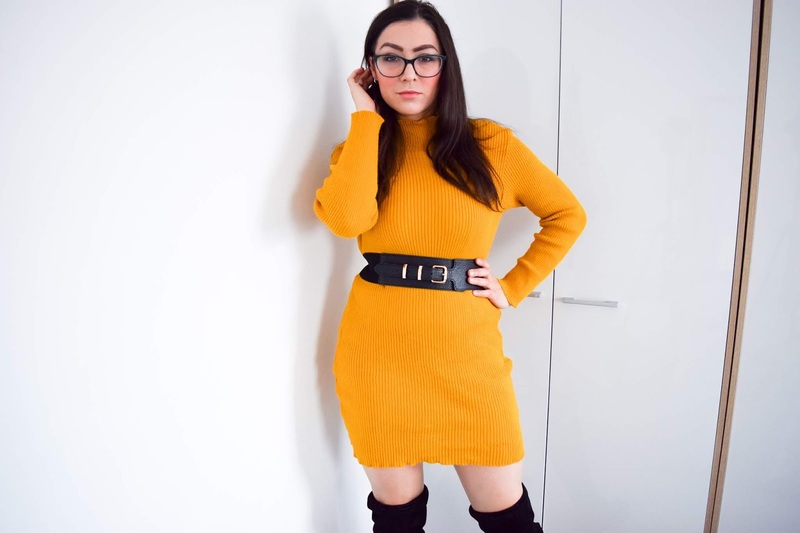 Last month, I had the fab opportunity to work with Femme Luxe and I'm so happy to say that I'm collaborating with them again to share with you some of their fab dresses. Femme Luxe are an online fashion retailer who are constantly keeping up with today's fast fashion. They've got a fab range of clothing from dresses and jumpsuits to jumpers and lounge wear. Today I'm sharing a mini dress haul. I have three dresses to share with you that I've been wearing and loving this week, starting with this yellow number. When I first tried this dress on, I wasn't sure about it. I wasn't sure about the fit but with a belt, it changed the whole look. 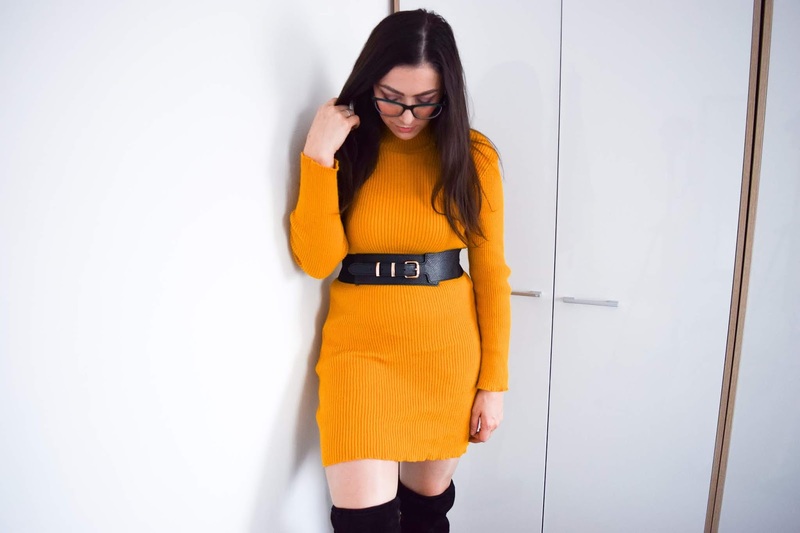 This dress is the Esmelia High Neck Bodycon Jumper Dress in Mustard. I love the colour and the high neck and long sleeves are perfect for the cold weather. I wore it the first time with black tights and brown boots but I'd also wear it the way I've styled it here with over-the-knee boots. I think it looks really classy, cosy and perfect for a date night outfit. The next dress I have here is the Ella, Black Knit Block Colour Jumper Dress and my top favourite of the three dresses. Again, not only is it cosy, but it looks amazing with my over-the-knee boots. It's such a simple dress but it's a statement too thanks to the wide and contrasting sleeves. I've worn it twice in the last week because I like it so much! Once I wore it with a gilet and some ankle boots and the second time the way I've styled it here. I think I prefer it with the over-the-knee boots. It looks cooler! 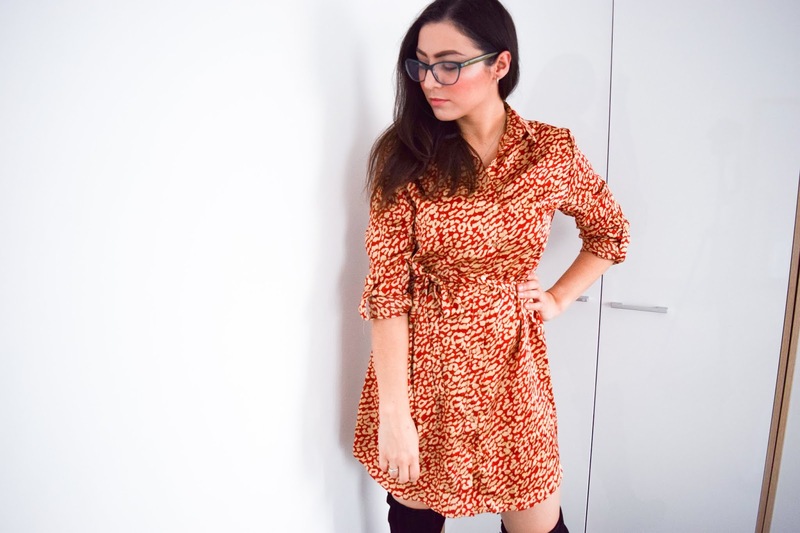 Last but not least I have this gorgeous Bobbie, Red Animal Cheeta Print Silk Shirt Dress. I've been looking to add some more leopard print in my wardrobe so when I saw this dress, I just had to get it. Not only is it in a currently popular print but it's also in a currently popular material. I've seen silk dresses left, right and centre and it's nice to finally have one in my wardrobe for a little something special. What I like about this dress, is that it's a great day dress. I've got jumper dresses galore but I haven't actually got that many suitable winter day dresses. I wore this the other day with a faux fur gilet and it looked really good. It's one of those dresses that you can make smart, casual or both at the same time, dependent on how you wear it. I really liked that this dress came with a belt tie but I think next time I'm going to try wearing it with my black waist belt for a little more detail too, just because I don't feel like you can see the belt tie very well. It's perfect for bringing in the waist and adding some shape to the dress in case you didn't have a different belt for it. I did also get another dress but unfortunately it was too big for me and so I decided not to style it but still share it because it's a beautiful dress and I wished it fit me well. This dress is the Amalie, Rose Extreme Turtle Neck Knit Bodycon Dress. It is a pretty pink jumper dress with a chunky turtle neck and button detailing around the waist. I really do wish it looked better on me because I was really looking forward to it but it just wasn't right for me. I probably needed a smaller size. Overall, I'm really happy with the dresses I do have out of the four. They're all fabulous quality and fit well (bar one). Despite the fact I'm collaborating with Femme Luxe on this ocassion, I wouldn't be working with them again if I didn't like them. I would recommend giving them a go and their prices are quite reasonable too. I'm really keen to see if I can find a Christmas dress from there too. Which of the three dresses are your favourite? Have you ever shopped from there before? Let me know in the comments - which now work again!